Welcome by Hans Welling | Welcome by Anatoly Zaleski | Theme | Committees | Venue | Conference fee | Accommodation | Transport | General Information | Programme | keynote speaker. You are cordially invited for the sixth ICEVI International Conference for East-European countries. This conference will be held on 11 and 12 October 2013 in Chernigiv, Ukraine. The theme of the conference is: Full participation in the Society; All starts with Early Intervention and Itinerant Teaching. This conference will also be the closing of a three years cooperation project between two boarding schools for children and visual impairment in Ukraine and two Dutch Organisations Proforkids and Royal Dutch Visio. Also the Dutch Embassy in Kiev has contributed to the cooperation project. The conference offers the opportunity to share experiences concerning inclusive education and full participation in the society of people with an impairment; in this case mainly people with a visual impairment. So we can learn of each others experiences and make a contribution to the social participation, to a society in which everyone is equal, but also different. I hope to meet you in Chernigiv. The International Council for Education and Rehabilitation of People with Visual Impairment ICEVI-Europe is a global association of individuals and organizations that promotes equal access to appropriate education and rehabilitation for all people with visual impairment so that they may achieve their full potential. Each child is an individual from birth he has equal rights and freedoms. Whatever his physical or mental limitations the child has always a scope for development, the use of which can significantly improve the quality of his life. Early Intervention and development of Inclusive Education are fundamental for achieving this target. I want to emphasize that Early Intervention and introduction of Inclusion in secondary schools, including those for children with visual impairments, are relevant for educational system of Chernihiv region. That is why for us it is very important that the VI International Conference of Eastern- European countries on the issue of "Full participation in society: all starts with Early Intervention and Ambulant Educational Support", initiated by the International Council for Education and Rehabilitation of People with Visual Impairment ICEVI-Europe, will be held on 11-12 October 2013 in Chernigov. At the conference it is planned to discuss topical issues such as the sharing of national and international experience of inclusive education, the problems arising during implementation of inclusive education, training of the teachers to work in inclusive classes, provision of a multi-agency approach in organization of inclusive education, etc. We hope that the conference would be a convenient platform to share experience and develop common approaches to issues of education of the children with visual impairments in terms of inclusion, will give a new impetus to the development of early intervention and the provision of early intervention for children with special educational needs. I wish fruitful work, success and adoption of constructive solutions to all of the participants of the International Conference! The consolidation of the efforts of all interested parties will accelerate problem solving for the benefit of our children. All starts with Early Intervention and Itinerant Teaching. More than 130 countries have ratified the Convention of the Rights of Persons with Disabilities. More countries will follow. This convention concerns the right to full membership to the society of people with impairments. This implies an important challenge to make the society accessible for every citizen, young - old, ill or healthy, with impairment and without impairment. A society for every citizen. A society, which is characterized by diversity. This process of inclusion should start as early as possible. Kindergartens which are accessible for children with impairment. The same goes for regular schools. However, it must go together with help to parents and child, early intervention and help to pupil and teacher of the mainstream school, itinerant teaching. This is the theme of the conference. The colleagues from Ukraine gladly will tell their experiences but they are very interested in the experiences in other countries. The fee has to be paid cash before the welcome party on Thursday 10 October or before the conference on 11 October. Participants with disabilities may be accompanied by one attendant. In this case the attendant does not pay the registration fee. Personal attendants for participants with disabilities receive a special badge with a VISITOR sign on it. WI-FI- on all the territory of the hotel, breakfast – buffet. Each room has a telephone, TV, fridge, bathroom. Deluxe rooms are equipped with air conditioning. Breakfast is included in the payment for the hotel. Hotel checkout time - 12:00, hotel reservations can be canceled the day before the date of arrival. Hostel of Chernihiv Regional Post-Dyploma Institute. Reduced price room rates - the rate 50 hryvnia, there are 50 of such places - 17 rooms with three beds in the room. Breakfast in the room rate does not include cost of meals in the dining room. Breakfast is not included in the payment for the hostel. The cost of the meals in the institute’s canteen: breakfast 16.50, dinner UAH 11.00. The shuttle service is provided from the airport, the railway station to the hotel and back. Download: General information [doc] about Ukraine and Chernihiv. Download also programme in Russian language: Программа Конференции. Zalesskiy A.A., head of Chernigov Regional Administration of Education and Science. The role of the parents in protecting the rights and interests of the children with disabilities. Increasing of the impact on the provision of the high quality of life for the children with disabilities through the establishment of the parent organization. Experience and prospects of early support in the training and education of children with visual disabilities. System of the maintenance of professional-labor socialization of persons with visual impairments. Shoev Gaib, Dushanbe, director of the Special boarding school for primary classes for the blind and visually impaired children in Dushanbe, Tajikistan. Glushenko E.A., PhD. ped.sc., assistant professor of typhlopedagogy of the Institute of Correctional Education and Psychology NPU named after M.P. Drahomanov. Ukraine. Architectural and informational adaptations of secondary schools, as a guarantee of access to inclusive education. Psychological-pedagogical willingness of teachers of secondary schools to implementation of inclusive education of children with visual impairments. Semenyshina T.A., PhD. ped.sc., assistant professor of typhlopedagogy of the Institute of Correctional Education and Psychology NPU named after M.P. Drahomanov. Ukraine. Readiness for school of preschool children with visual impairment in the context of inclusive education. Kovalinskaya Irina Ivanovna, Terebovlia, Ukraine. Scientific and methodological development of a successful student in the conditions of the inclusive institution. Kotljarova T., Ushkalova Nana, Slovyansk, Ukraine. Sumarokova I. G., Nizhny Novgorod, Russia. Nasibulova E. A., Moscow, Russia. Preparation of the future tiflopedagogs to use advanced informational technologies in special preschool institutions for children with visual impairments. Geert William van Delden, Visio, Netherlands. Fedorenko S.V., doctor of pedagogical sciences, professor, deputy Director of the Institute of Correctional Education and Psychology NPU named after M.P. Drahomanov. Ukraine. 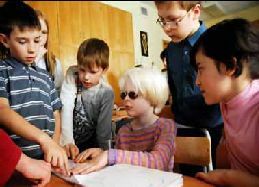 Inclusive and integrated education of children with visual impairments in Ukraine: the formation, development and prospects. Myasnikova L. V., candidate of pedagogical sciences of the State Pedagogical University, Saratov, Russia. Comprehensive support of children in terms of educational and rehabilitation center. Economic education of preschool children with visual impairment as a factor of their future inclusion into society. Children's creativity - a reliable way to make life of the special child happy. Features of the sensory-motor development of children with visual impairment. Barco V.V., graduate student of typhlopedagogy department of the Institute for Special Education and Psychology NPU named after M.P. Drahomanov. Ukraine. We can do so much more than we think: The role of the parent organization in protecting the rights of children with disabilities. Ellen van den Broek, The Netherlands. Playing is growing. B) Education is action, action is education. Psychological and educational support for families raising children with visual limitations in the advisory center "Light of Hope"
Luisa Fenu is Policy Officer at CBM EU Liaison Office. In that capacity, she supports the Advocacy Manager to cover the inclusion of persons with disabilities in all processes at the EU level. Great emphasis is put on development and human rights policies (e.g. the 2012EU Human Rights Strategy), and human rights-based approaches to development. In 2012 Luisa was also Chair of the International Disability and Development Consortium (IDDC) EU Task Group, and now she chairs the Concord’s Task Force on Human Rights Based Approaches. Luisa's mother tongue is Italian and she speaks fluent English and French. Luisa holds an university degree in International Relations and Diplomacy with a specialisation in European politics. She also holds a master's degree in International Human Rights Law and Humanitarian Law. Luisa started to work for CBM in 2011 as an intern with CBM’s Emergency Response Unit and six months later was imployed as Policy Officer. Throughout her accademic carreer, Luisa studied in several European countries (Belgium, Ireland, France, italy), starting from secondary school where she spent one accademic year abroad. 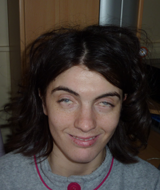 Luisa has a strong interest in research, with a particular focus on the UN’s Convention on the Rights of Persons with Disabilities (CRPD).